Once upon a time, a family in Briers North decided to add some larger-than-life decorations to their home for Halloween. A number of people stopped by to admire them and began trick-or-treating in our quiet neighborhood. The next year, encouraged by the positive response, more families decorated their homes and wore costumes to give candy to trick-or-treaters. Even more visitors came by to trick-or-treat that Halloween. It became the holiday that so many of us adults remembered when we were growing up long ago. And so the tradition grew until the number of visitors has grown into the thousands. Halloween at Briers North continues to attract visitors from inside and outside the city of Dunwoody. 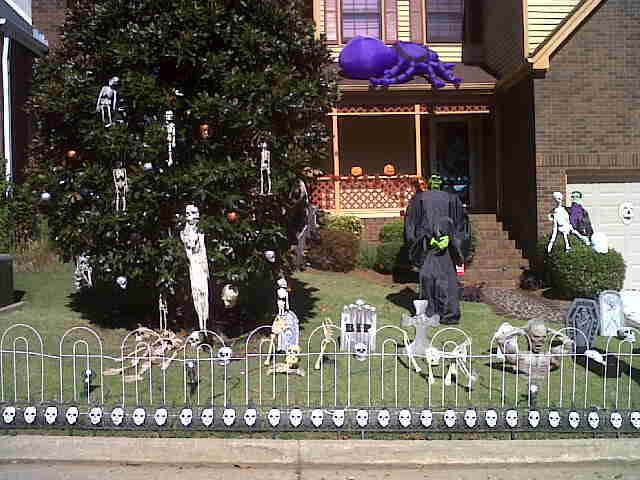 The subdivision's households contribute to the celebration by decorating their yards, distributing candy, and by hiring the Dunwoody Police to direct traffic. Halloween is ALWAYS and ONLY celebrated on October 31st. Rain or Shine! The distribution of candy begins at 6:00pm and stops at 9:00pm. No one is admitted to the subdivision after 8:30pm. We start closing the subdivision to automobile traffic at 5:45pm and we do not reopen until 9:30pm. There is NO parking inside Briers North subdivision. If you park outside, please do so legally. In some years past, Crossroads Church of Dunwoody (formerly North Peachtree Baptist Church) at the corner of Tilly Mill & Peeler has allowed cars to park in their parking lot. If they do so again this year please help them with a donation. Trick-or-treating in Briers North on Halloween is AT YOUR OWN RISK. This is a public event on public streets and is NOT sponsored by any association or group. Briers North assumes no liability or responsibility for visitors. If you enjoyed Halloween in Briers North in the past, or plan to visit this year, please make a donation. Donations help to make this a safe event for everyone and are always appreciated! Below are some photos of our annual Halloween celebration. Click on the photos to view a larger image.